JTF (just the facts): A total of 47 color photographs, framed in white and unmatted, and hung edge to edge against white walls in the single room gallery space and the entry area. All of the works are pigment prints, made in 2014. Each is sized 15×12 (or reverse). The entire set, entitled Lost Coast, is being sold in an edition of 2, with one full set staying together and one being broken up into individual images. A monograph of this body of work is forthcoming from TBWBooks. Comments/Context: Curran Hatleberg’s photographs of life in and around the city of Eureka, California, and the surrounding Humboldt County area test the balance between small wonders and bleak realities. With the distance of an outsider, he is an observant witness, seeing grandeur in the towering forests and worn down despair in the dusty front yards. His pictures are full of everyday struggle, where resistance and defiance percolate to the surface in the flash of a glance. Like many younger photographers evolving their own artistic voices, Hatleberg is in a sense actively wrestling with photographic history here. The aesthetic ghosts of past masters linger everywhere in his images – Frank, Eggleston, Shore, Friedlander, even Soth, Brodie, and Wall (even though these pictures are in no way staged). Hatleberg is seemingly thoughtfully aware of these many influences and echoes, but has continued to push on, trying to find his own path forward within that crowded and esteemed landscape. It’s a risky, confidence questioning path to be sure, as it’s all too easy for viewers to see the connections (that open door green car reminds me of Meyerowitz!) and overlook Hatleberg’s original contributions to the genre. But there is much more than reverential emulation going on in this project – his approach is more akin to synthesis and adaptation, dropping allusions but doing so with the knowledge that he is going to step beyond them in the end. Tension and anxiety have been part of nearly all of the great works Hatleberg is standing upon, and the best of his pictures examine these same emotions in the context of 21st century pressures and lifestyles. While dashboard sunsets and flares of light through the redwoods offer moments of uplift, life in Eureka is filled with more than its share of grinding weight. 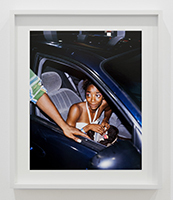 One of Hatleberg’s strengths is his eye for multi-layered human interactions collapsed into one frame. On dry dirt roads, on scrubby grass, and in the in-between paved areas around fast food joints and gas stations, he captures extended groups of families, friends, and largely unattended children, their arrangements seemingly controlled with painterly precision. His scenes of guys working on a car amid the angles of chain linked yards and red roses, a man slicing a watermelon under the canopy of a gas station, and fans watching an unseen game in the hazy afternoon sun are particularly strong. Repeated glances away from the camera or out of the frame have a quiet wistfulness, as if the faraway dreams of the residents are contagious – everyone is looking for something beyond what lies in front of them. Hatleberg mixes this thread of dissatisfied wishful thinking with a multitude of related emotions. There is the steely eyed wariness of a man pumping gas, the careless exhaustion of a boy lying on the sidewalk, the grimace of an older man waiting near a payphone, and the endless running to catch up of a man behind a pickup. Each adds to the overall sense of unease, which is then reinforced by the nostalgia of old sports trophies, the grimness of dead roadside vegetation, and the resigned acceptance of burned down houses and sandy vacant lots the kids have colonized for play. Even Hatleberg’s moments of tenderness (the skin to skin shaving of a head, a tiny baby dog left on the wooden stairs, a proud fatherly embrace, a masculine father-son longing for behind-the-glass motorcycles) traffic in an undercurrent of discouragement, like the plucky still-trying effort of pink roses blooming in a trapped stucco corner. At first glance, I was skeptical that Hatleberg could succeed on the incredibly difficult path he has chosen, but after spending more time with the nuances of his pictures, I have become more and more impressed with his accomplishments. While it is subtle and at some times dispiriting in its conclusions, this is without a doubt an impressive and mature first solo show, delivering a much more sophisticated vision than most initial offerings, and if the photobook version of Lost Coast is executed and produced with similar care, it has the potential to be a knockout. Thematically, this body of work fees like the sequel to Soth’s The Last Days of W, where political angst has moved to the interior lands of America and settled in for the long haul. But Hatleberg has made that evolving emotional landscape resolutely his own, and in the process, made a solid first step toward defining a visual voice that is both respectfully aware of the past and taking us somewhere new.